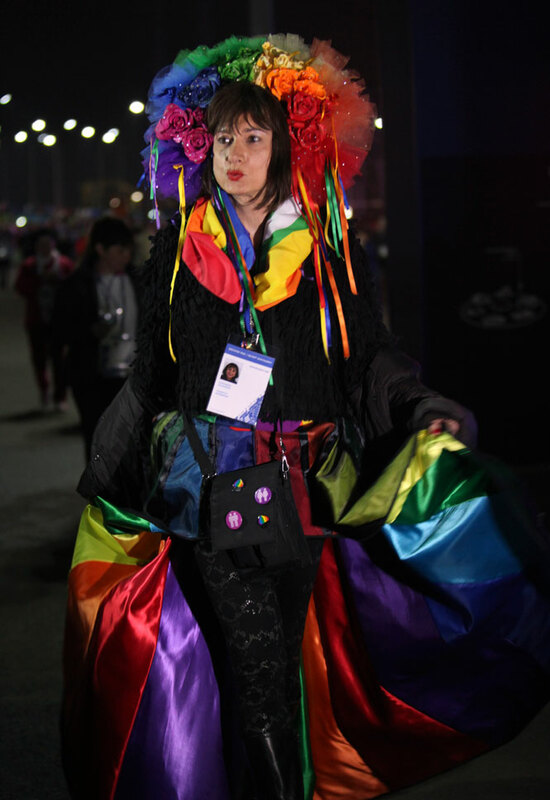 Vladimir Luxuria, a former Communist lawmaker in the Italian parliament and prominent crusader for transgender rights, walks in Olympic Park at the 2014 Winter Olympics, Monday, Feb. 17, 2014, in Sochi, Russia. Luxuria said she was detained by police at the Olympics after being stopped while carrying a rainbow flag that read in Russian: “Gay is OK.” Police on Monday denied this happened. SOCHI, Russia — An Italian activist shouting “It’s OK to be gay” and dressed in a rainbow-colored outfit and large headdress was detained Monday as she entered an arena to watch an Olympic hockey game. 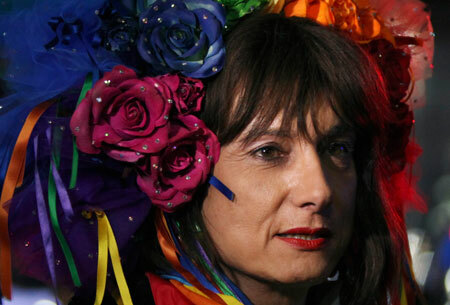 Vladimir Luxuria, a former Communist lawmaker in the Italian parliament who has become a prominent transgender rights crusader and television personality, was stopped by four men and then driven away by police in a car with Olympic markings. Luxuria had been walking around the Olympic Park in Sochi for about two hours. She was shouting “Gay is OK” and “It’s OK to be gay” in both English and Russian. Luxuria earlier said she was detained on Sunday evening by Russian police who told her she should not wear clothes with slogans supporting gay rights. Police denied detaining her. On Monday, the Italian activist walked around the Olympic Park with a group of journalists, attracting onlookers. Some Russian fans stopped to pose for photos with her. Luxuria arrived at a ticket inspection barrier at the hockey arena just before an evening game was due to begin. She passed through the barrier and was being given directions to her seat when four men who were not wearing any identification surrounded her and started shouting “take her away.” They then led her out of the venue and to the parking lot. Before she went to the stadium, Luxuria said she did not want to be arrested. It was not immediately clear why Luxuria was detained, although last year, the Russian parliament passed a law banning “propaganda” of non-traditional sexual relations among minors.